The ability to accurately detect transcripts or proteins in Drosophila tissues is critical for studying their abundance and localization related to the development process. Here is the description of a straightforward procedure to dissect pupal wings. These wings can be used as samples in several techniques (immunohistochemistry, PCR assay, etc.). Bolatto, C., Parada, C., Colmenares, V. A Rapid and Efficient Method to Dissect Pupal Wings of Drosophila Suitable for Immunodetections or PCR Assays. J. Vis. Exp. (130), e55854, doi:10.3791/55854 (2017). Wing development in Drosophila melanogaster is an ideal model for studying morphogenesis at tissue level. These appendages develop from a group of cells named wing imaginal discs formed during embryonic development. In the larval stages the imaginal discs grow, increasing its number of cells and forming monolayered epithelial structures. Inside the pupal case, the imaginal discs bud out and fold into bilayers along a line that becomes the future margin of the wing. During this process, the longitudinal primodia veins originate vein cells on the prospective dorsal and ventral surfaces of the wing. During the pupal stage the stripes of vein cells of each surface communicate in order to generate tight tubes; at the same time, the cross-veins begin their formation. With the help of appropriate molecular markers, it is possible to identify the major elements composing the wing during its development. For this reason, the ability to accurately detect transcripts or proteins in this structure is critical for studying their abundance and localization related to the development process of the wing. The procedure described here focuses on manipulating pupal wings, providing detailed instructions on how to dissect the wing during the pupal stage. The dissection of pupal tissue is more difficult to perform than their counterparts in third instar larvae. This is why this approach was developed, to obtain rapid and efficient high quality samples. Details of how to immunostain and mount these wing samples, to allow the visualization of proteins or cell components, are provided in the protocol. With little expertise it is possible to collect 8-10 high quality pupal wings in a short amount of time. Drosophila wings are developed from the wing imaginal discs. The primordial of these wing discs are put aside during the embryonic development as small groups of 20-30 imaginal cells that invaginate from the embryonic epithelium. While the larva is growing to the third instar stage, mitosis occurs in the imaginal cells at specific characteristic times raising its numbers (approximately 50000 cells) and forming the wing disc1,2,3,4. As the cells proliferate, they fashion a tubular epithelium, resulting in a self-folding compact spiral. During pupation, the disc epithelium telescopes out to form the two-layered wing and the longitudinal veins start as lacunae between them, which occurs twice during wing developmental5,6. The arrangement of veins always has an identical pattern; the ability to easily identify every alteration within the veins formation makes mutations extremely visible (e.g. missing or extra veins, changes in the vein positions, etc.). Interestingly, the phenotype variations are usually the evidence of mutations in known or novel components of signaling pathways that are relevant for wing development. One of the pathways that plays a role in determining the position and maintaining vein and intervein territories is the Hedgehog (Hh) pathway6,7,8. Given the importance of the pupal wing as a model system, it will be important to obtain good quality samples to work with. In the past, scientists that have published protocols to dissect Drosophila wings have not given an appropriate guide to attain workable samples. Without the guidance of a researcher one cannot clearly visualize the process. In these alternate dissecting approaches the pupa is split in two, separating the wing from surrounding tissue and repeatedly washed to remove the debris. This kind of approach claims to leave the wing free of contaminates but due to previous experience the process is slower and there is a higher chance of compromising the structure of the fragile wings9. The procedure described here was developed by the demand to find a fast and efficient method to obtain pupal wing samples suitable to detect specific proteins or transcripts using immunodetection protocols or polymerase chain reaction (PCR) assays. In order to illustrate this, the expression and localization of Patched (Ptc or the canonical receptor of the Hh pathway) is detected in pupal wing samples, providing a protocol that includes relevant details to successfully carry out the complete procedure. 1. Collection and culturing pupae. Remove 0 h after puparium formation (APF) or prepupae using a wet paintbrush from cultured vials and place them in new vials to almost complete the development period (see 2.1 and 2.2). Note: A healthy population of flies should be maintained using standard culturing protocols. After three or four days in which the eggs are laid, the adults can be removed from vials to allow an optimal development of the individuals. They are maintained at a constant temperature until the third instar larvae initiate pupation. The larval/pupal transition is marked by the formation of the prepupa considered the 0 h APF. The prepupa is an immobile white larva that has an oblong, round shape with protruding anterior spiracles. 2. Transfer, dissection and fixation. Transfer the pupae (2 h before the development time is complete) with a paintbrush, to the microscope slide with double-sided tape adhered to it. Position the pupae to form a row with dorsal sides up and cephalic ends facing the same direction. Return the microscope slide to constant temperature and allow the pupae to complete the appropriate developmental time (i.e. 24-30 h APF). Note: The microscope slide with the double-sided tape will be a transitory dissection platform to remove the pupal case (see below). The time lapse on the microscope slide (outside the vial) helps to dry the pupal case making it easily breakable with forceps. Remove the operculum from the pupal case using forceps. Break the case with forceps (as shown in the video) making a line along the side of the pupa to the caudal end of it. With the appropriate illumination it is possible to detect the internal shape of the pupa making evident a space just above the hinge of the pupal wing. This space serves as a guide to perform the opening without damaging the pupa. Remove portions of the case, picking them up by the opened border and carrying them to the opposite side where the double-sided tape will hold them. At the end of the dissection the pupae will be almost "naked", only a small piece of the case will be covering the posterior tip. Note: The purpose of leaving a small amount of case on the upper caudal end is to ensure a smooth release from the case onto the slide with the double-sided tape. Reasoning behind this action is because if you remove too much of the case you greatly risk damaging the pupa. On the other hand if you remove too little, the pupa will not easily come free of the case. Push down (with forceps) the remainder of the case. This movement will raise the anterior end of the pupa, allowing both the head and thorax to stay in a preferential position to adhere and to be transferred in the subsequent step. Take a new slide with double-sided tape and invert it on the pupa or pupae row. We recommend performing this approach by observing the movements with the aid of the stereomicroscope to prevent breakage of the pupae. Press slightly to make the pupae stick to the tape and gently glide the slide in order to remove the pupae from the rest of the cases. Invert the microscope slide: the pupae will be stuck on the dorsal side at the level of their head / thorax area. Cover all the naked pupae with 4% paraformaldehyde and wait 10 min. In our experience, this lapse of time with the fixative helps to change the consistency of the cuticle making it firm, less sticky and easy to handle. Note: To perform the ribonucleic acid (RNA) extraction, substitute paraformaldehyde for phosphate-buffered saline (PBS) made with RNase free water and remove the pupal wings making a cut (with the aid of scissors) near the hinge point of each appendage. Using forceps, transfer the pupal wing to a microcentrifuge tube with 1 mL of guanidinium thiocyanate and phenol reagent. After collecting a total of 50-80 wings, store the microcentrifuge tube at -80 °C until performing the RNA extraction10,11. Make a small incision at the hinge region of the wing or near it. Allow the fixative to reach the wing epithelium. Using a pipette (p200) flush fixative over the wing. When flushing replace the contaminated fixate with new. After flushing, keep wing in fixative for 5 min. Note: Although this maneuver helps to clear away the majority of the contaminating tissue, some hemocytes and fat droplets can remain trapped in between the dorsal and ventral epithelial layers of the wing (see Figure 1A). Tear with forceps from the cuticle borders (as shown in the video) expanding the hole and enabling the release of the wing epithelium from the cuticle sac. Once the wing tissue is released, leave it in the paraformaldehyde solution to complete 30 min of fixation. Transfer the fixed wings to a one 4-welled plastic dish filled with PBST (Triton X-100 0.05%). Store overnight at 4 °C. Permeabilize the tissue incubating the pupal wings in PBST (Triton X-100 0.2%) for 15 min using a rocking platform to facilitate a gentle liquid medium movement. Note: Until mounting the samples, the steps should be performed using a rocking platform. Block the samples using PBSTA (BSA 3%, Triton X-100 0.1%) for 1 h.
Use the same buffer to dilute the primary antibody (mouse anti-Ptc, 1:100) and incubate the pupal wings overnight at 4 °C. Incubate with secondary antibody (e.g., anti-mouse conjugated to fluorochrome) diluted to appropriate concentration in PBSTA (BSA 3%, Triton X-100 0.1%) at room temperature in the dark, for 2 h.
Note: If it is appropriate, use 4',6-diamidino-2-phenylindole (DAPI) and/or phalloidin to counterstain the tissue. Add these probes with the secondary antibody taking into account the emission wavelength of the fluorochromes to prevent the overlap of signals. Prepare a sample slide by placing 4 dots of transparent nail polish on the microscope slide as if they were the vertices of a square. They will be the points where the coverslips will rest, helping to avoid crushing the tissue. Place 30 µL of mounting media (glycerol/Tris-HCl 80%) in the center of the square of the dots made with nail polish without touching any of the corners (dots). Take a pipette with a yellow cropped tip, load some mounting media and then draw in several pupal wings. Transfer pupal wings to the dot of mounting media on the microscope slide. With the aid of a tip, spread the mounting media and sink the pupal wings to prevent them from floating. The morphology of the tissue will be kept if the wings remain flat when the cover glass is placed on. Before placing the cover glass, remove air bubbles. Lower the coverslip onto the samples trying to prevent the generation of air bubbles. This movement can be done with the aid of forceps. The protocol offers a straightforward method for obtaining pupal wing samples that retain the familiar morphology of the wing. From these preparations it is possible to obtain stacks of images that could be projected as 2-D or 3-D, to investigate distribution and/or the enrichment of proteins during the differentiation of the wing. A similar protocol (see the note in 2.9) can be used to collect the large pupal wing sample (involving 50-80 pupal wings) necessary to synthesize complementary deoxyribonucleic acid (cDNA), the template used in PCR reactions. (A) Patched, the canonical receptor of Hedgehog pathway, was visualized at 24-30 h APF using mouse anti- Ptc. Nuclei were counterstained with DAPI whereas actin filaments are visualized using a green-fluorescent phalloidin. Actin distribution helps to localize wing veins and its relation with patched expression. At the same time, phalloidin stain reveals the presence of some hemocytes and fat droplets (large circles) as contaminating tissue. 20x magnification, anterior is up. Scale bar, 100 µm (B) Amplicons to actin (lane 1, 280 bp) and ptc (lane 2, 236 bp) were obtained using cDNA synthetized from messenger RNA (mRNA) wing sample generated by a similar dissection protocol. MW, molecular weight. Please click here to view a larger version of this figure. The method of dissection described in this video can be used to prepare high quality samples of Drosophila pupal wings from different development stages for many types of techniques (e.g., immunofluorescence, cDNA synthesis to PCR assays, in vitro wing development). In terms of this method the scientist involved have used 24-30 h APF. However there should be no obstacle within the essential steps in dissection of younger or older pupa. Changes may have to be made to accommodate smaller stage pupa. The protocol could be performed to dissect one pupa or several pupae at the same time. This helps to accelerate the procedure, making it easier to reach a large number of wings dissected. In this case there is the option of removing a row of 4-5 pupae at the same time. You can remove the pupae together or if it is not possible, continue to remove individually onto the same slide (see section III of the video: "Multiple pupae dissection"). To remove the naked pupa from the opened case, it is important that the posterior tip is small enough. It is possible to remove the case entirely; although it would make the transfer faster, the removal of the entire case is challenging and there is a greater risk of damaging the pupa. Experience dictates that an important maneuver to consider is to leave (the last 2 h to complete the development time stipulated) the pupa attached to the microscope slide inside the incubator but outside the vial. This lapse of time helps to dry the case making it easier to break. Another critical step during dissection for immunohistochemistry, is to peel off the cuticle that covers the wing epithelium, thereby granting access of the antibody to the entire wing surface. This step should be done after fixing for several minutes (at least 5 min after making the incision at the hinge point) because the fixative stabilizes the tissues and changes the cuticle consistency, making it easier to peel. While performing all immunohistochemistry steps, be sure that the wings are in constant movement (rocking platform). The movement helps to improve the interchange and penetration of the solutions during washes and incubations. Nevertheless, it is important to perform them gently avoiding the occurrence of undesired distortions in the morphology of this fragile structure (i.e., it is sufficient that the oscillations of the platform slightly move the liquid medium containing the samples). This procedure provides an alternative and complementary approach to the already published methods for pupal wing dissection. We would like to thank CSIC for the financial support given to this project, to Mariana Di Doménico for her technical assistance with confocal microscopy; to José Leonardo Báez for his manuscript corrections; to Luciano Correa for his dedication to the creation of the video; to Natalia Rosano for lending her voice for the video and the Bloomington Drosophila Stock Center for providing the stocks used in this study. The Apa1 monoclonal anti-Ptc developed by Isabel Guerrero was obtained from the Developmental Studies Hybridoma Bank (DSHB) under the auspices of the NICHD and maintained by The University of Iowa, Department of Biological Sciences, Iowa City, IA 52242. (working dilution 1/100) Developmental Studies Hybridoma Bank (DSHB) By Isabel Gerrero from DSHB under the auspices of the NICHD and maintained by The University of Iowa, Department of Biological Sciences, Iowa City, IA 52242. Serrano, N., O'Farrell, P. H. Limb morphogenesis: connections between patterning and growth. Curr Biol. 7, (3), R186-R195 (1997). Blair, S. S. Compartments and appendage development in Drosophila. Bioessays. 17, (4), 299-309 (1995). Klein, T. Wing disc development in the fly: the early stages. Curr Opin Genet Dev. 11, (4), 470-475 (2001). Beira, J. V., Paro, R. The legacy of Drosophila imaginal discs. Chromosoma. 125, (4), 573-592 (2016). De Celis, J. F., Diaz-Benjumea, F. J. Developmental basis for vein pattern variations in insect wings. Int J Dev Biol. 47, (7-8), 653-663 (2003). Blair, S. S. Wing vein patterning in Drosophila and the analysis of intercellular signaling. Annu Rev Cell Dev Biol. 23, 293-319 (2007). Bier, E. Drawing lines in the Drosophila wing: initiation of wing vein development. Curr Opin Genet Dev. 10, (4), 393-398 (2000). De Celis, J. F. Pattern formation in the Drosophila wing: The development of the veins. Bioessays. 25, (5), 443-451 (2003). Classen, A. K., Aigouy, B., Giangrande, A., Eaton, S. Imaging Drosophila pupal wing morphogenesis. Methods Mol Biol. 420, 265-275 (2008). Bolatto, C., et al. 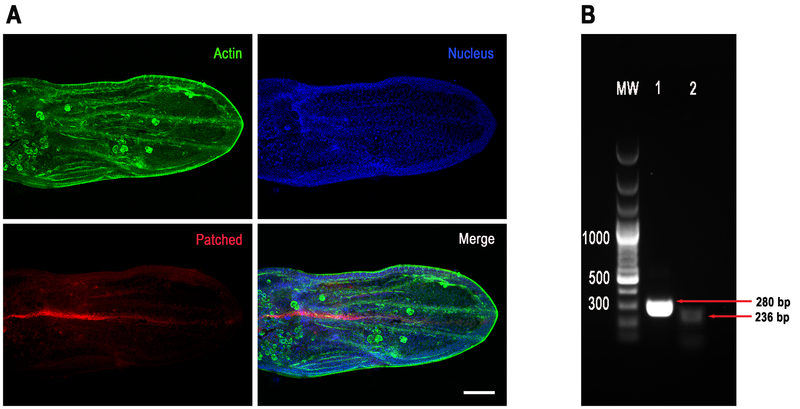 Spatial and temporal distribution of Patched-related protein in the Drosophila embryo. Gene Expr Patterns. 19, (1-2), 120-128 (2015). Zuniga, A., et al. Genes encoding novel secreted and transmembrane proteins are temporally and spatially regulated during Drosophila melanogaster embryogenesis. BMC Biol. 7, 61 (2009).